When we were researching where to go on our honeymoon my wife had said that she had always dreamt of going to Santorini. Well her and my wish came true. 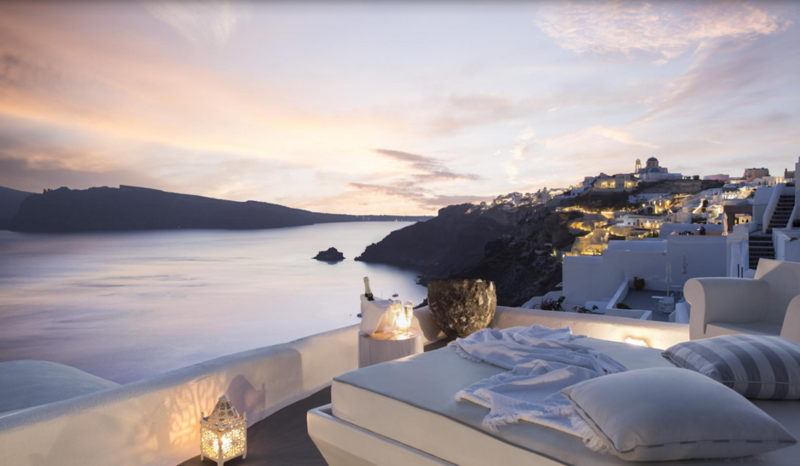 We decided Santorini was going to be our honeymoon location. We started researching and talking to people and after all those discussions and looking at website after website we decided we wanted to stay in Oia (pronounced Eee-yah). We decided to stay in Oia as this place looked amazing and was away from the hustle and bustle of Thira the capital. We also wanted to stay somewhere that we could enjoy and build long lasting memories. Do not get me wrong I am sure anywhere in Santorini would have completed that long lasting memory. 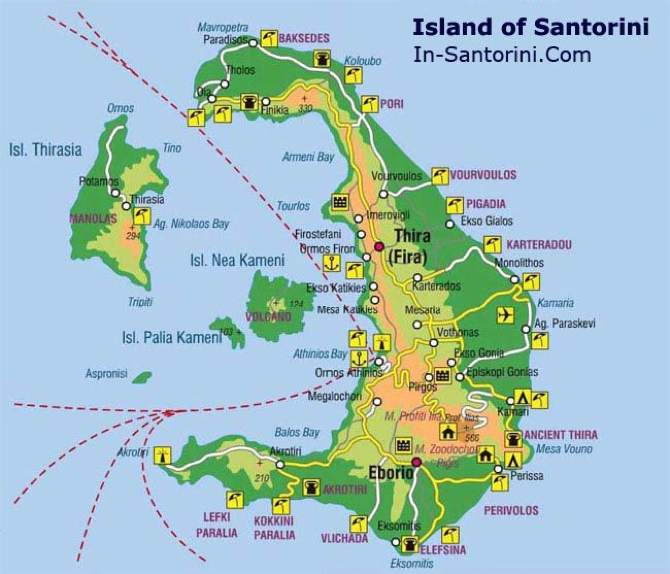 Santorini as you can see from the map is shaped as a big backwards C and it surrounds the caldera, which is the “active” volcano area. Oia which is where we stayed was simply amazing. Our hotel was just on the out skirts of the town which was fantastic and was built into the hill side. Our hotel room was like a cave. 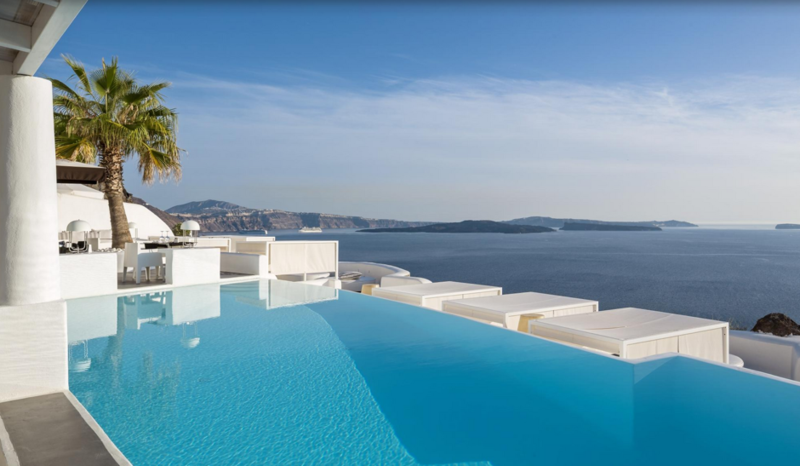 Oia is located at the furthest point of Santorini. You have all seen those Santorini postcards of the gorgeous sunset, well these have most likely been taken from Oia. We found Oia to have amazing restaurants. We were there for 7 days and we ate at a different restaurant every day. The hotel we stayed at was a great choice as we could be dropped off by car and we did not have to walk our luggage to the hotel reception. The hotel we stayed at is called Kirini Suites & Spa. 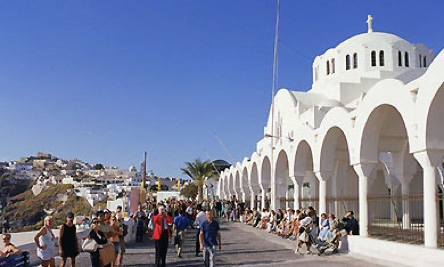 The main street of Oia is actually pedestrian access only and there are other hotels that are located on this mall type street. The shopping in Oia is amazing. Lock your wives up as there are amazing jewellery and clothing stores. We went during the financial crises of Greece which for us was fantastic as everywhere you went cash was King and the discounts to be had were amazing. There are a couple ways to get to Santorini and it really comes down to how long you have for your travels. We opted to fly in from Athens and it was a direct flight that took approximately 1 hour. You can opt for the ferries and these can take up to 5 hours. When we arrived into Santorini, we had organised for the hotel shuttle. This took us directly to our hotel. This was great as we had arrived at night and I would not have been comfortable driving to the hotel. As we spent most of our time is Oia we did not need to organise too much transport for the entire holiday. What we did do was hire a smart car for 2 days through our hotel. The car was delivered to the hotel and collected from the hotel. I was surprised at the cost and it was true value for money. The concierge at the hotel organised everything for us. She did recommend staying away from the traditional tourist mode of transport “Vespa’s and ATV” as she said they are dangerous and you cannot escape the sun. As we were there for our honeymoon we wanted to relax and we had planned only to do so much. Our days were spent taking in the views and enjoying the many vantage points on the island. We walked through Oia a number of times and at different times of the day the views were slightly different. We did lots of walking so take a good pair of walking shoes. In Oia we did a lot of shopping. 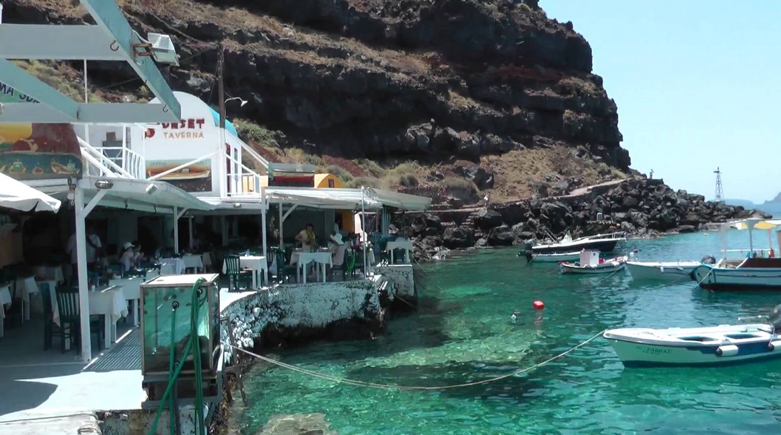 We walked down to Ammoudi bay where we had lunch at Sunset Taverna. Lots of stairs down. After an amazing seafood lunch at right on the waters edge we decided to head back up to Oia. My wife had vowed never to ride a donkey but after lunch looking back up towards Oia we both got onto donkeys and went up. This was a great experience and I will never forget this. Donkeys are only used to take people up the hill. You cannot go down. Midnight mass is the most important of all religious days leading up to this big day. This is the true celebration of Christ. At midnight, the church turns off all its lights and all church followers light candles. During this part of the service all the followers sing out the traditional hymn “Christos Anesti” or “Christ has risen” After the service we all try and take the candles home and let them burn for as long as possible. Our concierge had told us about a few places to go and see the famous sunset, which we did. We had also organized a sunset couple’s massage at Caldera Massage Studio . This was the best decision we had made as we were at the point of Santorini and we could catch the sunset in comfort and without distraction. We shared a bottle of bubbly and some cheese while the sunset. The most romantic part of this was sharing it with my wife. Adjacent to where we were you could see hundreds of people climbing onto the castle and lined all over the paths around the area to get the best view possible. The island of Santorini has many walking tracks that take you to amazing spots. You can walk the Caldera from Oia all the way to Fira. The sights are amazing. Depending on how many stops you make to take photos and take in the amazing views this walk could take a couple of hours. We had pre booked a Sunset cruise. We were picked up from our hotel and taken down to the cruise pick up location. The cruise took us past the Red beach and we stopped at Faros for a swim and a little talk about the area. We then went round the lighthouse and headed to the hot springs. The weather was fantastic and the knowledge of the crew on board and the hospitality was amazing. We met some amazing people as well and shared a few drinks and some laughs. On the day we went the hot springs were a little busy so our captain stopped and anchored just away from the area. We went for a swim, but be prepared the water is freezing and I am guessing the reason for this is the actual depth of the area. The rocks are sharp as they were formed by an eruption. The trip back was fantastic. The back of the boat was the place to be and watching the sun setting over the horizon with no obstructions was simply glorious. 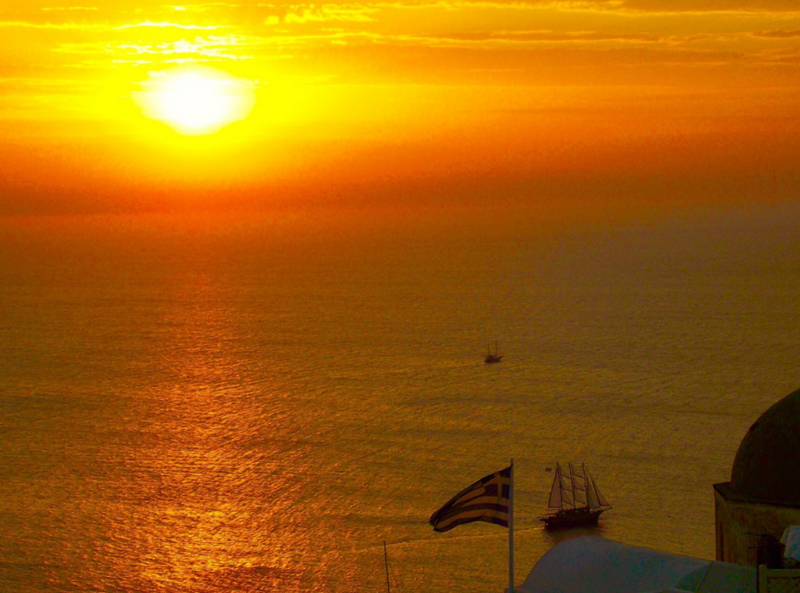 You have not seen a spectacular sunset until you have seen it in Santorini. 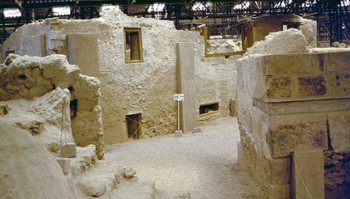 On the day, we had hired the car we drove around the island and we visited the ancient town of Akrotiri. 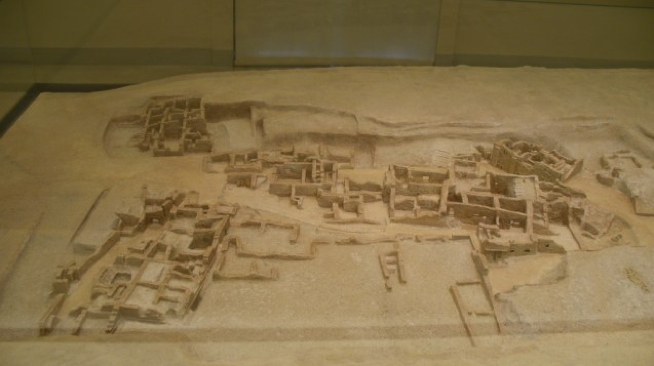 This is the town that had been buried thousands of years ago by an eruption on the island. 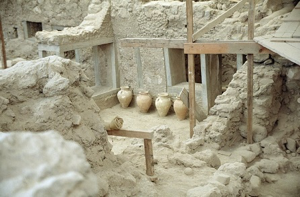 It has been excavated and only a small percentage has been unearthed so far. The preservation of the town and breathtaking. The design and history that was visible was astonishing. This is something you must do and see a piece of history. 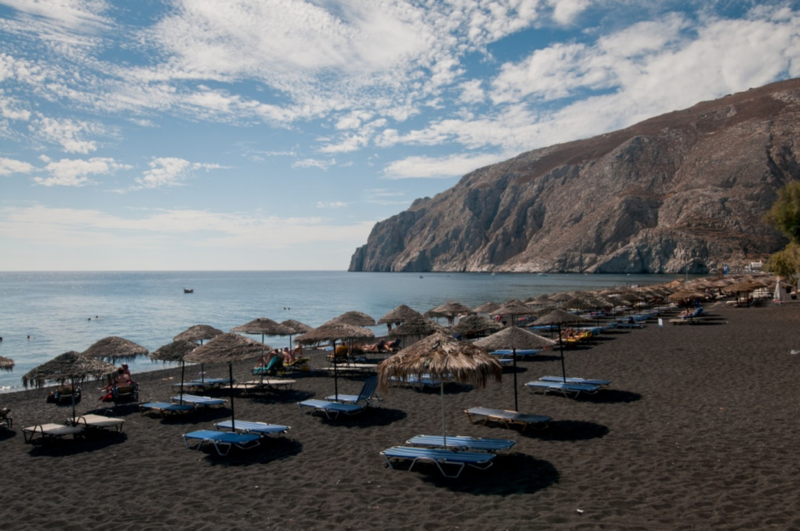 After going to Akrotiri we decided to go and visit another famous beach called the Black beach. Yes this beach is actually black. It is not a sandy beach but a beach of small black pebbles. The beach her is set up for the tourist and the best part of the beach are the sunbeds you can use for free at some places as long as you ordered from them. They had waiters and service at the sunbeds. There was also free wifi. We enjoyed the cocktails and the music being played along the beach. We relaxed and just enjoyed our surroundings. A little bit of advice, if you are going to walk down to swim make sure you have something on your feet as the stones get extremely hot. The are many activities to do at the beach and you can hire all sorts of things there. Entering the water we were both surprised as we felt like the seabed was not sand or small pebbles but one large rock. It was slippery so extra car needs to be taken. The water was so refreshing and cooled us down. Once we had enough of the sun and ready for a meal we decided to head into the taverna and sit and have a decent lunch. The hospitality was amazing. I reckon you would need a few weeks on the island to try all the restaurants. They had a DJ playing music all sorts Greek, English etc. Other things to do on the Island include Beer tasting and Wine tours. The islands main income comes from tourism. The other form on income for the island is their agriculture. Well let’s speak more about the Wineries. You can organise wine tours through your hotel or you could just visit a few. If you are not into wine then head to the Santorini Brewing company and do some beer tasting. We visited Fira and this is the town that is party central. The town is old with some modern twists. The architecture is truly amazing. Built on the top of a cliff you can see for miles. The cruise ships stay at sea and all the passengers come off at the bottom of the cliff. 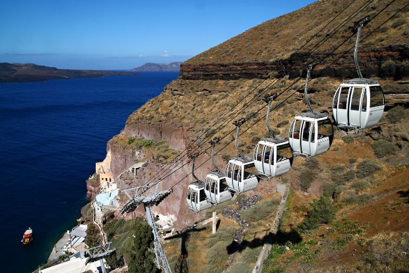 The passengers can either walk up to Fira, ride a donkey up or have a gondola ride up. There are so many restaurants and shops to visit you could almost spend 2 days just shopping. You can’t go on holiday and not eat. Trust me in Santorini the food we ate everywhere was amazing. We had breakfast included in our hotel so every morning we would eat at the hotel. The hotel breakfast included breads, juices, fruits, pastries and then you could order eggs done your way. I enjoyed the Santorini omelette. The chef at the hotel was amazing. We ate dinner at the hotel once. We booked to have a sunset dinner and we were placed right on the edge of the deck overlooking the view of the Caldera. We had a table all to ourselves and it was so peaceful. 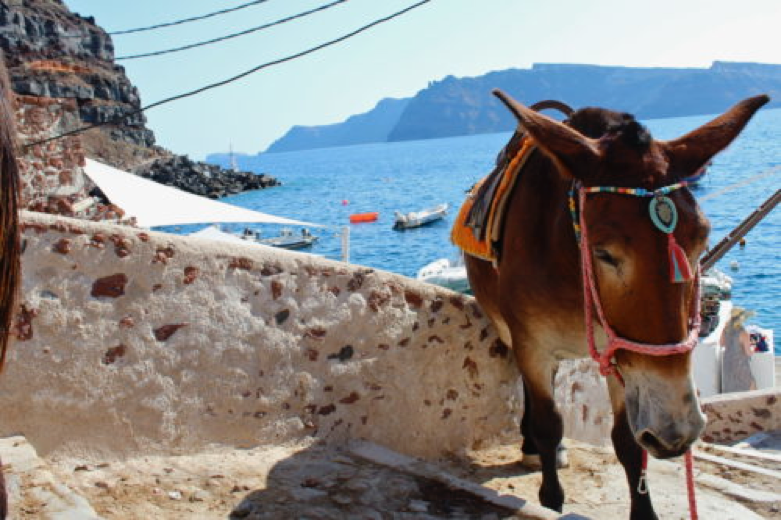 Santorini is such a romantic place to visit. We asked the concierge for a nice romantic place to eat in Oia and she was very well prepared and gave us some ideas. We ended up choosing one and the meal was fantastic. The service was again top notch and we had a very enjoyable time. 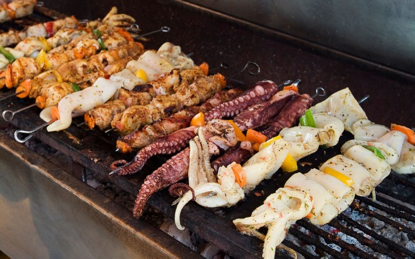 We had so many lasting memories in Santorini the hospitality, service and quality of the food was amazing for an island. I enjoyed everything and anything seafood. 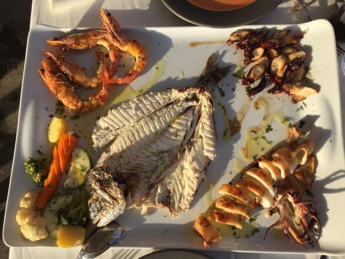 On one of the night we ordered a seafood superior platter for 2, the waiter did make a mistake and ordered us just the normal platter for 2, when we asked for the whole fish they had realized they had made a mistake and they did remedy their error. We were actually glad they made the mistake as the fish came out and it was fresh out of the oven. The time delay gave us time to enjoy the other seafood and to take in the views from the restaurant deck. We enjoyed Greek wine with our meals and occasionally had Ouzo after dinner. After we had finished our main, the restaurant manager came out and offered us desert on the house. I am sure the manager was part of the family that owned the restaurant as they bought out some freshly made Greek yogurt with a Greek sweet. On some of the days that we spent out walking around and getting back to the hotel for a needed rest we would lounge on the sun beds at the hotel. We enjoyed so many cocktails and snacks near the pool. The area was just so relaxing. Being in the Mediterranean we would not have dinner until late, obviously the sun would only set late at night so our days were very long but worth it. We could fit in so much. Most of the islanders speak a little English and mostly communication is very easy. Many foreigners work on the island as well. Make sure you have cash as well as your credit card. Cash is preferred and if you are buying jewellery, there is always a cash price. Tipping is not common practice as this is normally included in your bill. Whenever we experienced great service or service beyond the normal, we did leave extra behind.